The Sami people speak a language that is a member of the Uralic linguistic group along with languages such as Finnish, Estonian and Hungarian. Norwegian and other Indo-European languages are not related to the Sami tongue. 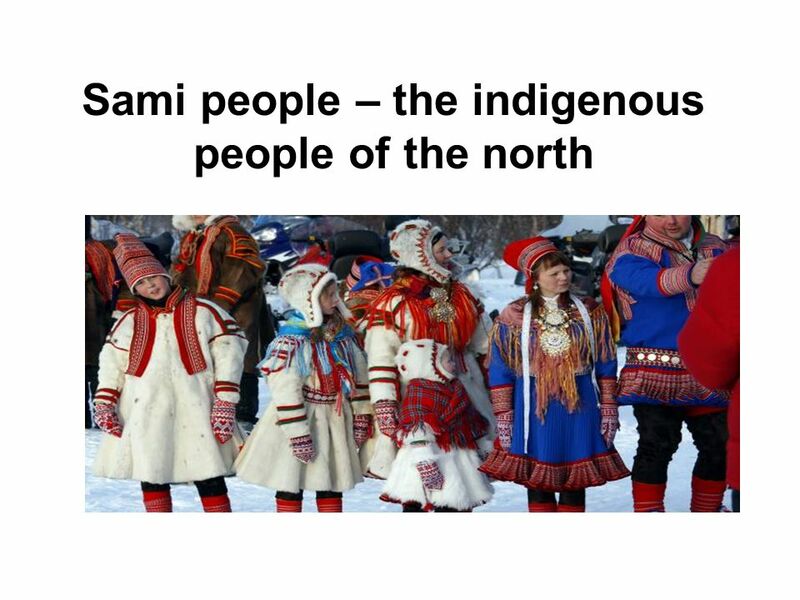 The different languages A total of nine different but closely related Sami languages are spoken in the Sami region. Today, three of these dialects are in active use in Northern Norway. 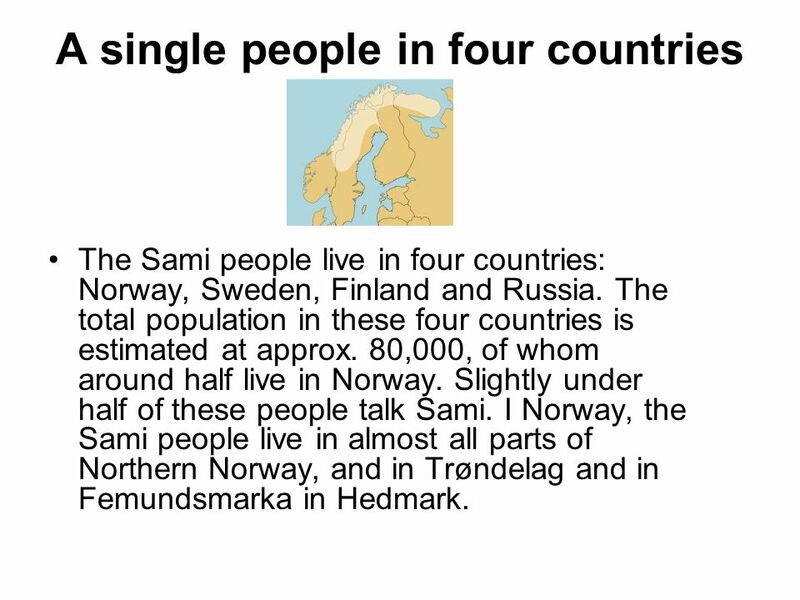 Sami people from the south of Northern Norway can talk effortlessly to their nearest Sami neighbours in Sweden, but cannot communicate with Sami people from the far north. The dialect boundaries do not follow the linguistic borders, however, as most of the dialects are spoken in multiple countries. The Sami language is currently the major language in inner Finnmark and is also used in small communities in most parts of Northern Norway as well as in some environments in the Northern Norwegian towns. 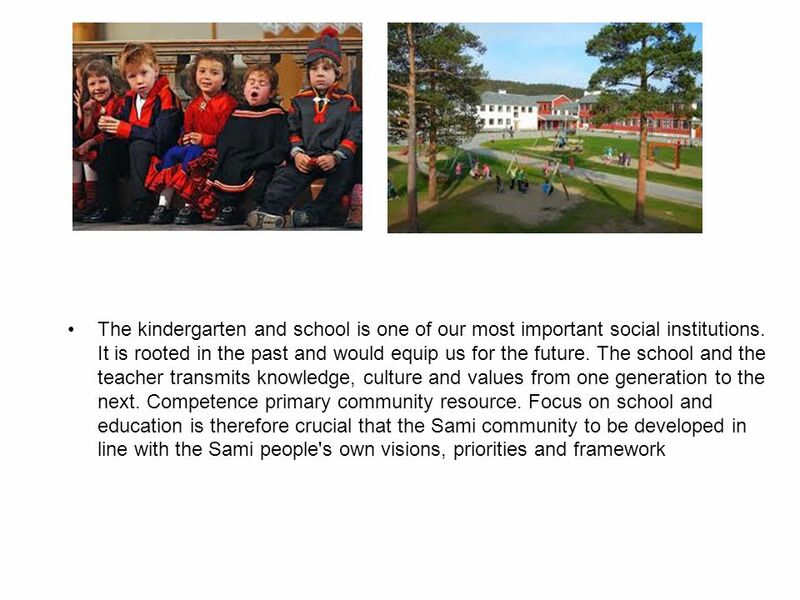 6 All Sami children have an individual right to Sami education in schools. 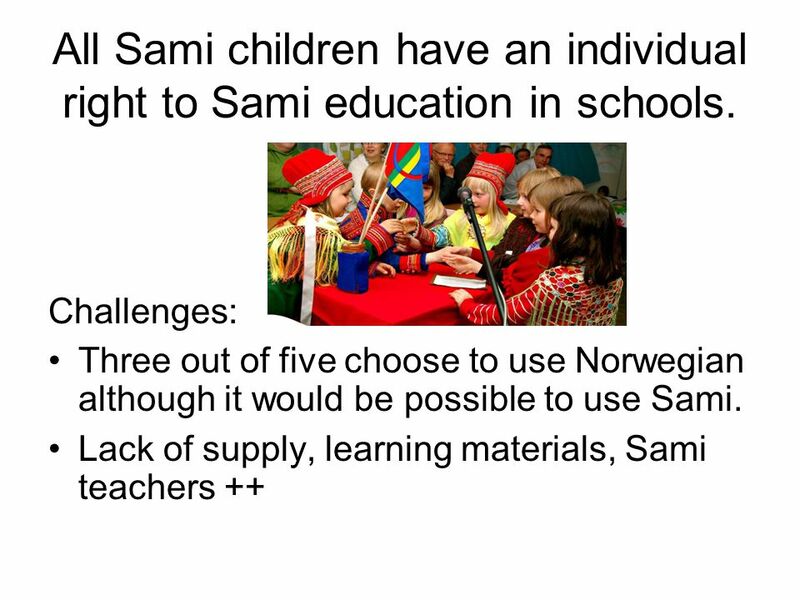 Download ppt "Sami people – the indigenous people of the north"
Marina Kuzman Croatian National Institute of Public Health Leuven, 2010 European Union for School and University Health and Medicine. 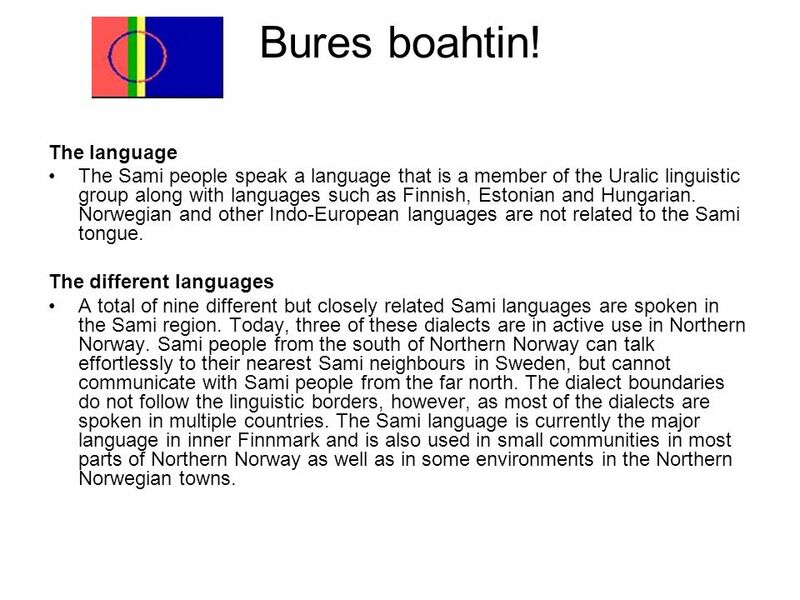 The use of Sámi today Based on 2004 report of the Sámi Language Board. Sámi law and language rules From the Norwegian Sámi Parliament As of June 28, 2005. Nordland County. Population: Municipalities ranging from 470 inhabitants (Træna) to (Bodø) Area: km 2 Nordland has 25 % of Norways. Session 4: Local, provincial, regional government and autonomous structures Mr.Lars-Anders Baer The Sámi Parliaments – It’s Relevance as a model of excising. Politics of small languages in Europe Pirkko Nuolijärvi Helsinki, November 23, 2007 Research Institute for the Languages of Finland. KS BEDRIFT – KS Enterprises (The Norwegian employers’ organisation for locally owned enterprises) Organises more than 500 companies in the municipal and. Revitalization of Inari Saami: reversal language shift in changing speech community Bodø, SLDR Winter School Annika Pasanen, Ph.D.student at. Helsinki as a multilingual language community Helsinki as a multilingual language community Pirkko Nuolijärvi Barcelona, September 30th, 2010 Research. 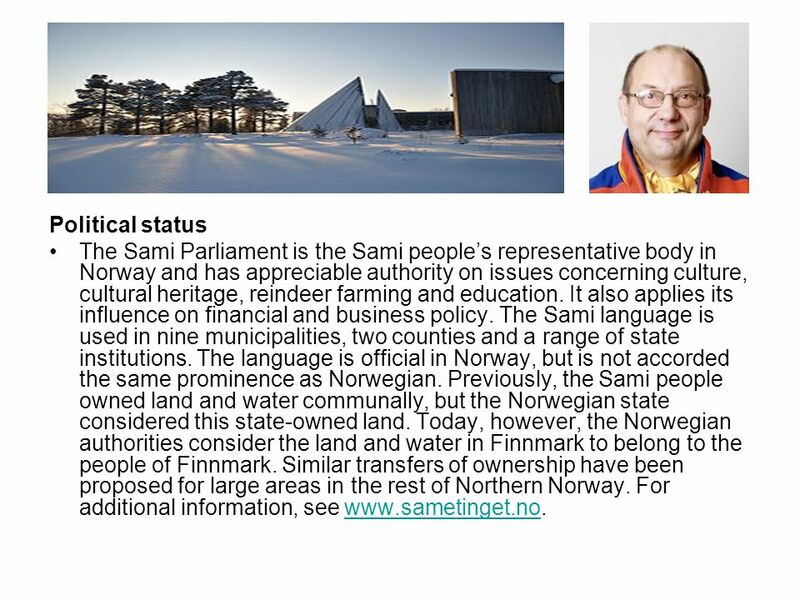 The Sámi People: Today’s Issues. Land and water rights ILO Convention No. 169 on Indigenous and Tribal Peoples in Independent States, which Norway (the. SS6G8 Locate selected features of Europe. Sámi is cool! Sámi parliament’s report on the Sámi language March 18, 2004. The Nordic Council of Ministers KEN FORUM 2013, Cape Town. Minority Language Conference Hanasaari-The Swedish- Finnish Cultural Centre November 27th and 28th 2008. Languages of schooling and the right to plurilingual and intercultural education Council of Europe, 8 – 10 June 2009 Curriculum for Norwegian as a second. I. Requirements  You are to choose a continent to present to the rest of your group. You will do research on the continent you choose, create a visual.